Wonderfully written. This book at me on the edge of my seat with every page! 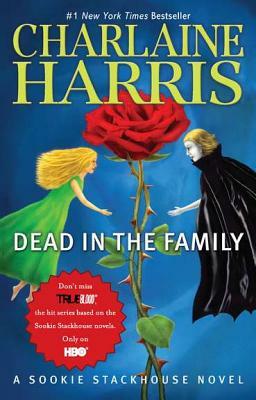 After all that happened in the Fae Wars that preceded when Niall, Sookie?s fairy great-grandfather, closed the door to Fairy, the ninth installment of the Sookie Stackhouse/Southern Vampire Mystery series starts with a very depressing feel to it. Eric?s position as sheriff of Area 5 is threatened by Victor, Felipe de Castro?s vampire in Louisiana, and shocking to both me and Eric, Sook wishes him dead. However throughout the book, she?ll go on about how murder is morally wrong no matter the reason. This is something that Sookie will soon have to face. The morning after a full moon night hunting on Sookie?s property, one of Alcide?s pack members tells her that there are traces of two fairies having been on her land very recently, and a dead body is buried that seems to have been there a while. Reminding Sookie to ask Eric what he did with Debbie Pelt?s body, and wondering if Dermot could still on this side of the closed door to Fairy. Claude asks to stay with Sookie. Claudine, Sookie?s cousin and fairy godmother, was pregnant and killed in the Fae Wars. It?s very sad that Claude is the last of the triplets alive. To his credit, he is a whole lot less of a jerk, and he makes an honest effort while he is staying in the Stackhouse house. When a vampire tracker finds a second corpse on Sookie?s land, the mystery starts. Who corpse could it be, and who put it there? To complicate matters, Eric?s maker shows up in Sookie?s bedroom window, thankfully after they you know what. His timing is terrible with the delicate position Eric is in with Victor. What is it that Eric?s master wants after all these years? The government is pushing to force the two-natured to register, and that is not settling well with everyone. The church members are protesting, and the two-natured who are and have been serving the country are mad at being treated as illegal aliens. The depressing feel of this book soon fades, and the excitement is back that gave me goose bumps more than once. It?s one of the most heart-felt novels of the series, and I?m convinced that book 10 will be even better than this one.